Residents of Papaxtla, Chilapa municipality, Guerrero, and members of the Regional Coordination of Communal Authorities (CRAC) have denounced the violent harassment of seven homes in the community. According to La Plaza, on 27 May, some 50 police from the Federal Attorney General’s Office (PGR) and the Federal Police (PF) arrived in unmarked vehicles, masked and carrying heavy weapons, and proceeded to break the security line at the principal access-point of the community, entering violently into homes. Though they lacked search warrants, they seized arms and the electoral card of commissioner Pablo Narciso Rosario. According to El Sur, the material they confiscated in the home of the CRAC coordinator, Genaro Francisco, included a .22 caliber rifle, a .20-odd rifle, a .22 pistol, and a 9mm pistol, in addition to ammunition, and three radios. They also mentioned the presence of a helicopter flying over the zone at low elevation. Bernardino Sánchez Luna, coordinator of the Communal Police of Rincón de Chautla, has requested that the state government return the arms to the organization, as they had been acquired by the people to protect themselves and the territory. In this way, he distanced the CRAC from participation in the occupation of Chilapa city on 9 to 14 May, as perpetrated by an armed group. The day after the violent searches, another convoy of State forces, ministerial police, and military arrived to Papaxtla, supposedly after having received reports of armed men in the community. Communal police and residents of the community explained their possession of arms as having to do with their membership in the CRAC. Thereafter, the Army and police withdrew. After completing 31 days of a hunger strike (the final five without consuming liquids), the coordinator of the Communal Police of Olinalá, Guerrero, Nestora Salgado García, suspended this form of protest after the Guerrero state government committed himself to promoting her release and the transfer of two other communal police officers who are imprisoned in a federal prison. She has called on Gonzalo Molina Gonzalez, a promoter from the Regional Coordination of Communal Authorities-Communal Police (CRAC-PC), one of these two prisoners, who has been held for more than a year and 7 months, to suspend his hunger strike which he had undertaken in solidarity with her on 14 May for health reasons. On 4 September, a press-conference was held in Mexico City as part of the activities of the Women’s Committee #FreeNestora which seeks the liberation of Nestora Salgado and other prisoners belonging to the Communal Police of the Regional Coordination of Communal Authorities (CRAC-PC) in Guerrero. Other irregularities and violations of due process were denounced, including the conditions faced by the imprisoned communal leaders. Also present at the event was the Front of Resistance of Los Ángeles, which shared letters from two senators and seven congressional representatives from the U.S. that called on Secretary of State John Kerry to immediately attend to the case of Nestora Salgado. Beyond this, there was denounced the lack of adequate response to the demands of the victims of tropical storm Manuel (2013). 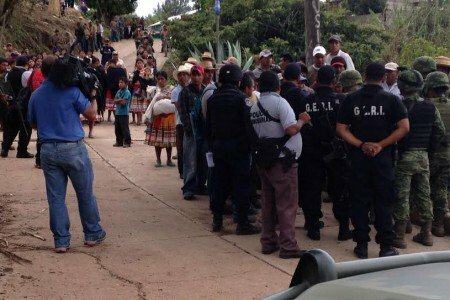 Edith Herrera, member of CRAC-PC, denounced that the aid promised by the government has not arrived to the Mountain region of Guerrero. She claimed that more than 129 billion pesos for the “New Guerrero” plan were used for “political means,” leaving the region “abandoned [and] plundered.” She indicated furthermore that, with the Crusade against hunger, soldiers entered several communities on the pretext of installing communal eateries. Since August, greater conditions have been placed on women who benefit from the “Opportunities” welfare program, because several women had been injected with contraceptives as a condition. The claim is that this means amounts to an “extermination” of the people. On 14 August, in a press-conference held in Mexico City, female activists, journalists, students, academics, social activists, and women in solidarity announced the founding of the Women’s committee #FreeNestora to demand the release of Nestora Salgado García, a commander of the Communal Police in Olinalá, Guerrero, who is about to complete a full year’s imprisonment in the federal prison of Tepic, Nayarit. The Committee demands that she be immediately transferred to a facility in Mexico City. It should be recalled that Nestora was arrested by police and Navy units on 21 August 2013, thereafter charged with aggravated kidnapping and organized crime. 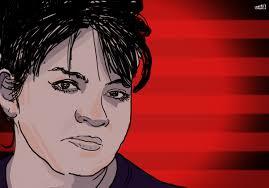 Though she has been absolved of the federal crimes of which she has been accused, she continues to be held in Tepic. At the conference, her daughter Saira Rodríguez denounced that Nestora has not had the chance to meet with lawyer, despite having requested one for more than six months, and that she has had her right to visit restricted, just as there has been a lack of medications that Nestora requires, with this being the reason that there is now a petition for precautionary measures to be awarded to her by the Inter-American Commission on Human Rights (IACHR). The women who comprise the Committee reported that they will carry out support actions both on social networks as well as physically in Mexico and the U.S., given that Nestora Salgado is a citizen of both countries. In this way, they called on civil society to unite and organize the struggle for the release of Commander Nestora Salgado, as well as of all other political prisoners.